Valentine’s day is one of the most important days of the year for restaurateurs: love is in the air, prompting romantic gestures that can result in record-breaking sales if you get your approach right. This blog post will present what we learned from Valentine’s day 2019 by looking into the huge Tenzo database to find actionable insights that you can use to prepare for Valentine’s 2020. In 2018, we saw that a Wednesday Valentine’s day had a powerful positive effect on sales for the rest of the week - the valentine’s afterglow. This year, however, Valentine’s day fell on a Thursday. For whatever reason, we did not see a repeat of the afterglow effect: sales were actually lower than usual on the day after (the Friday). Punters seemed to be tired after their romantic exertions - perhaps with the Thursday Valentine's day being so close to the weekend, they gave in to the temptation of an extra bottle of champagne, and felt under the weather the next day. The below graph shows general sales patterns through the week for a normal week, and the weeks of Valentine’s day 2018 and 2019. Note that the dramatic effect of Valentine’s day last year was not repeated this year. Let’s dig into some more details. Below are some valuable insights broken down by restaurant type: fine dining, casual dining, and gastropubs/country inns. 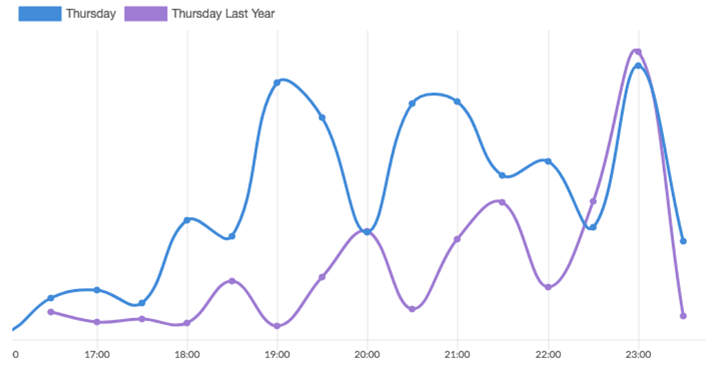 All of the following metrics are based on comparisons between Valentine’s day 2019 and the same day of the week (Thursday) one week earlier. The fine dining restaurants which use Tenzo increased their sales at an average of 35% on Valentine’s day 2019 in comparison with the previous Thursday. Valentine’s dinner is a great opportunity for fine dining restaurants!! Transaction size generally showed little change: perhaps because fine dining establishments are ordinarily full of romantic tables-for-two on a regular (non-valentine’s) Thursday night. However, the number of transactions exploded on Valentine’s day with an average increase of 45%. We also saw an average increase in the number of guests by 16%. Restaurants were evidently serving a lot more tables and will have been fully booked from early dinner to closing time. The following graph shows that on Valentine’s day, fine dining establishments were packed from around 6pm till late. The purple line shows a more normal pattern. Tip 1 - Make sure you are fully staffed from 5.30 or 6pm to keep up with the early rush. Spend per head was £2.5 more than on a usual Thursday. This made a very significant difference to the bottom line, but what exactly did our lovebirds order? Tip 2: Prepare your staff to up-sell cocktails, desserts and wine in order to increase spend per head. Great time to up-sell a really nice bottle of Bordeaux! Casual dining restaurants also did very well, with an average increase in sales of 30%! Transaction size was flat or even lower than usual. However, this is to be expected as restaurants fill their space with as many small tables-for-two as they can. We observed an increase in transaction number, also due to the smaller 2-people tables. The number of guests did not greatly increase: probably because Thursdays are usually very busy nights at the locations on our platform. What made sales better than usual was the improvement in average spend per head. People spent £2 more than usual. Most of the extra money wa spent on sides and desserts (50% more desserts ordered). Tip 3: The key to a successful Valentine’s dinner for casual dining businesses is to focus on up-selling sides, drinks and desserts to increase transaction size for 2-person tables. Tip 4: Figure out how to squeeze as many 2-person tables into your place as you can. If you don’t have enough small tables, consider hiring some, and temporarily moving out your larger ones. Tip 5: In order to handle the increasing number of transactions, restaurateurs should take a look at their staff scheduling - everyone will be extra busy tonight, and have more tables to look after than usual. Tip 6: Also make sure you have enough mobile POS units and that they are fully charged before 6pm - they will see a lot of use! Tenzo has many higher-end country inns and pubs on our platform: beautiful places well suited to a romantic Valentine’s getaway. These types of restaurants made an absolute killing on Valentine’s day. Customers flocked to the gastropubs and country inns on our platform: we saw an average of 70% boost in sales for Tenzo-using gastropubs! Transaction size increased at an average of 53% in gastropubs. Transaction number also increased: people ordered more times than usual - perhaps as they visited the bar for a second bottle of wine. Number of guests increased on average 40%. The average spend/head grew by 20%. Cocktails were the great champions here: normally popular only over weekends, cocktail orders increased 778% here! Tip 7: Be ready to serve a lot of cocktails! If your bar staff are likely to be over-stretched - create a special Valentine's cocktail list with a few choice drinks - and only serve these. Do as much cocktail prep as you can ahead of time. Tip 8: Prepare your staff: this is not exactly going to be a walk in the park. More orders, bigger orders, and more guests require another level of preparedness. Tip 9: Don't forget to look after your regulars - even if they are single. We can't prove this conclusively with the data, but we have an inkling that this crowd also gets caught up in the romance of the evening and spends more - their extra enthusiasm can probably provide an unexpectedly big boost to sales.